The first 2018 World Cup Semifinal takes place on Tuesday night and new 888sport customers can claim a double price boost on this match! Find here how to claim 8/1 France or 10/1 Belgium to qualify at 888sport! Max bet £5! France have grown in confidence through the tournament and are now the favourites to lift the cup. Belgium are currently 24 matches without defeat and have won all the World Cup matches so far. Who will go through? Choose your price boost at 888sport! 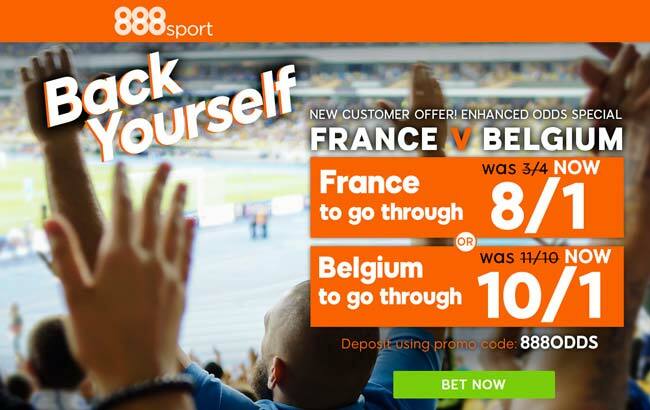 888sport offer 8/1 France or 10/1 Belgium to qualify! Max bet £5! Don't miss our France vs Belgium betting preview with predictions, betting tips, probable lineups, team news, enhanced odds, exclusive offers and no deposit free bets on the 2018 FIFA World Cup! Get 50/1 France or 60/1 Belgium to win with Betfair! SportNation offer 50/1 France or 50/1 Belgium to win. Max bet £1. Use deposit code SNODDS. Deposit £10 or more. Enhanced winning paid as bonus fund with 3x turnover at min odds of 1.60. T&Cs apply, 18+ GambleAware. Ladbrokes offer 33/1 France to beat Belgium + £5 free bet! SportNation offer 25/1 VAR to be used in ANY World Cup match. Max bet £1. Qualifying bet must be placed at the normal odds Min bet £5, max bet £5. Extra winnings paid in FREE BETS and added within 72 hrs of qualifying bet settlement. Free bet stakes not included in bet returns. Free bets expire 7 days after credit. Get 7/1 Khabib or 11/1 McGregor to win at 888sport. Max bet £5! "Get 8/1 France or 10/1 Belgium to qualify at 888sport (World Cup Semifinal Offer)"